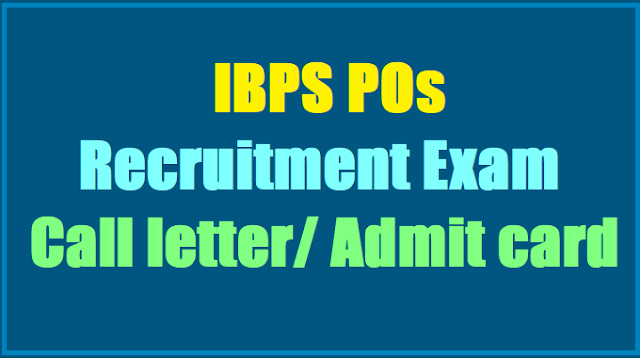 IBPS PO Main Exam Call Letter/Admit Card/Hall ticket To Be Released Soon, Exam On 26 November/ IBPS POs Recruitment Preliminary exam Results 2017 at IBPS portal: The Institute of Banking Personnel Selection (IBPS) declared the result of its online preliminary examination to recruit probationary officers (PO)/management trainees (CWE PO/MT-VII). The result can be viewed until November 7. The examination was held on October 7, 8, 14 and 15. IBPS plans to recruit 3562 probationary officers (PO)/management trainees in various public sector banks and other participating organisations through this process. Out of these, 1738 vacancies are for unreserved candidates, 961 for Other Backward Class, 578 for Scheduled Caste and 285 for Scheduled Tribe candidates. IBPS PO Main Exam Call Letter Released, Exam On 26 November: IBPS will release the PO main exam call letter soon. The exam is scheduled to be held on 26 November 2017. Main exam is of prime importance while making the final merit list for provisional appointment. Marks obtained in the main exam only will be considered for shortlisting candidates for interview. IBPS PO prelims result was declared on 1 November, a day after the scheduled date for the same. The result which decides the candidature of the candidates for main exam is qualifying in nature. Admit card for the main exam is yet to be released. Candidates can download the same at the official website ibps.in. IBPS PO Main Exam Pattern: The main exam will comprise of letter and essay writing, Reasoning & Computer Aptitude, General/ Economy/ Banking Awareness, English Language and Data Analysis & Interpretation. The exam will comprise of 157 questions and candidates will be allowed 3 hours 30 minutes for appearing in the examination. After the Main examination, qualified candidates will be shortlisted for interview. The final and provisional allotment of probationary officers will be completed by April 2018. The exam will carry a total of 225 marks and medium of question paper will be both English and Hindi. Institute of Banking Personnel Selection (IBPS) has released the hall tickets / Admit cards for the mains examination of recruitment of probationary officers/ management trainees (CWE-PO/MT-VII) on the official website. IBPS PO 2017 Preliminary (Prelims) exam results were declared on November 3 and the IBPS PO 2017 Main exam is scheduled for November 26. The IPBS released the scores of PO prelims exams this week. The scores of IBPS PO 2017 prelims have been released on the official website of the banks recruitment institute. IBPS PO online main examination call letter can be accessed from the official website of the institute; ibps.in. The Institute of Banking Personnel Selection (IBPS) on Sunday issued the call letters/admit cards for online preliminary exam to recruit probationary officers (PO)/management trainees (CWE PO/MT-VII) in various public sector banks and other participating organisations. The admit cards will be available for download till November 26. Steps to download the IBPS PO main exam call letters: 1) Go to official website of IBPS, 2) Click on the link to download call letter (admit card) for PO/MT-VII main exam, 3) You will be directed to the login page, 4) Enter your registration number and password, 5) Enter the captcha code, 6) Click on login and your admit card will be displayed on the screen, 7) Take a print-out and save it on your computer, The online main exam will be held on November 26 and its result will be declared in December. The interview will be held in January/February 2018, and the provisional allotment to the selected candidates will take place in April 2018. Step 2: Click on call letter link for IBPS PO/MT 2017 main Exam from top of the homepage. IBPS PO Main Exam Day Rules: Candidates shall have to take the call letter, photo identity proof (along with its photocopy) to the exam hall. 'The reporting time mentioned on the call letter is prior to the Start time of the test. For the Main examination the duration of the examination is 3 hours 30 minutes, candidates may be required to be at the venue for about 4 hours or more including the time required for completion of various formalities such as verification and collection of various requisite documents, logging in, giving of instructions etc.'. The Institute of Banking Personnel Selection (IBPS) will be conducting the Probationary Officers/Management Trainee (PO/MT) main examination on November 26. Any stationary item like textual material (printed or written), bits of papers, geometry/pencil box, plastic pouch, calculator, scale, writing pad, pen drives, log table, electronic, microphone, pager, health band etc. Other items like goggles, handbags, hair-pin, hair band, belt, cap etc. Any watch/wrist watch, camera etc. According to the official notice, "Any infringement of these instructions shall entail cancellation of candidate and disciplinary action including ban from future examinations and police complaints." IBPS PO Mains 2017 Hall tickets at ibps.in: The hall tickets for Probationary Officers/Management Trainee (PO/MT) Mains will be released by the Institute of Banking Personnel Selection (IBPS) soon. The hall tickets for Probationary Officers/Management Trainee (PO/MT) Mains will be released by the Institute of Banking Personnel Selection (IBPS) soon. All those candidates who will be appearing for the exam are required to keep a strict watch at the official website www.ibps.in. The exam is scheduled to conducted on November 26. Candidates who will clear the mains, will then be called for the interview. IBPS PO prelims result was declared on November 1. The prelims examination was of moderate to difficult level. Variations were seen in the pattern of all the three sections, that are, English language, reasoning ability and quantitative aptitude sections in the different shifts conducted throughout the day. IBPS POs Recruitment Preliminary exam Results 2017: The result of Probationary Officers (PO)/Management Trainees (CWE PO/MT-VII) online preliminary exam declared by the Institute of Banking Personnel Selection (IBPS). All those candidates who had appeared for the same are required to keep a strict watch at the official website www.ibps.in. The exam was on held on October 7, 8, 14 and 15. The online main exam will be held on November 26 and the result will be declared in December. An interview will be held for successful candidates in January or February 2018 and the provisional allotment will take place in April. Note: Candidates are advised to regularly check the official IBPS website for latest updates. All the dates given above are tentative. IBPS POs prelims call letter/admit card 2017/IBPS POs Recruitment preliminary exam call letter/admit card 2017: UGC NET 2017 Make corrections in application at cbsenet.nic.in: IBPS is expected to issue the call letters for online preliminary exam to recruit of Probationary Officers in various public sector banks and other participating organisations this month. The Institute of Banking Personnel Selection (IBPS) is expected to issue the call letters/admit cards for online preliminary exam to recruit of Probationary Officers (PO)/management trainees (CWE PO/MT-VII) in various public sector banks and other participating organisations this month (September 2017). The first stage of recruitment or the online preliminary examination will be held on October 7, 8, 14 and 15. The results of the preliminary examination will be declared in October 2017. The online main exam will be held on November 26 and its result will be declared in December. The interview will be held in January/February 2018, and the provisional allotment to the selected candidates will take place in April 2018. Note: Candidates are advised to regularly keep in touch with the official IBPS website : http://www.ibps.in/ for latest updates. All the dates given above are tentative. The last date for downloading the call letter is October 14. Bank job aspirants, ready to appear for IBPS PO 2017Prelims must be having a hectic schedule with lots of practice, revision and memorizing difficult formula. With hardly a few days left for the exam to begin, it is really tough to have a peaceful mind. But things do work wonder the other way. De-stressing is one of the sure shot ways to score good marks, when practices before the examinations. In addition to this, candidates must be aware of few generic rules for the exam. Make your own plan; know your strength, understand your weak points: Every person has different strong and weak points and you need to identify your strengths and devise your exam plan yourself. Do not blindly go on with the hearsay of peers and friends, think smartly and act smartly. Devise your strategy:Taking a test can help you in giving that much-needed finishing touch to your exam preparation. Take a mock test and practice your skills of time and topic management before the actual face off. Analyse your performance after the test. To avoid unnecessary tension, equip yourself with all the necessary documents: This point could not take a back seat in our checklist because it is the foremost thing to be taken care of the sooner the better. Take a print out your admit card and ID proof, and read the instruction of your admit card. Take 2 trips if you wish, while solving the paper: At first attempt the questions you find easy to approach and solve. Finishing them off will boost your confidence and keep you at bay from any stress. After you are done with all that you could have answered easily, then go for the second trip and try to attempt the questions you feel you can do with a little extra effort. Be careful while choosing what to attempt and what to skip: Your every move, your every decision will make or break your deal so it is very important that you choose very carefully what you are going to attempt in the examination. Don't be tempted and get engrossed in any particular section or question for too long. Don't take anything on your ego: Well, it is quite probable you may feel you know the concepts to solve a question just too well yet you are unable to crack it in the exam time, so just skip it, and take another question. Skip a question if you feel it is too time-consuming or you might not be able to get it right, at the end you have to score enough to clear sectional and overall cut off. Let nothing kill your speed! There are 100 questions for mere 60 minutes so keep a track of your time and don't get stuck anywhere. Be wise and spare some extra seconds to carefully read the instructions: It is good to be fast and save time when you have 100 questions for just 60 minutes but you have to be wise and careful as well. Instruction or directions of a question are very important and you should read the instruction of every question you are about to attempt. Do not ignore simple questions; they may require you to be cautious: Simple or easy level of questions can be your saviour in IBPS PO prelims, so don't just get engrossed in the difficult ones. Read the instructions carefully, and attempt simple or easy level questions to gain plus points in your scoring bag. Avoid making 'silly mistakes', they'll cost you a year: You've been longing for this opportunity to be a probationary officer. So try to keep at a bay from making silly mistakes. Carefully solve and analyse question, do not presume things, just read the direction and be careful as you will have negative marking. Get the thought of 'cut-off for IBPS PO Pre' out of your head: If the examination is of an easy level, it will be so for everyone else, so is the case even if it turns out to be of difficult level. Therefore focus more on preparation rather than quivering over the thought of cut off. First, concentrate on the exam and making a decent number of attempts according to its difficulty level. Rest things will fall into places. So don't overburden yourself and refrain from diverting your concentration. Keep your calm and be confident: Your confidence will help you sail through this recruitment, easily. No matter what is the difficulty level you'll face in the exam just stay calm and believe in yourself. With a composed mind you'll be able to crack through the examination, so sleep well and don't stress yourself out. The exam is scheduled to be held on October 7, October 8, October 14, and October 15.